I have heard so much about Nomad that I knew I had to put them on my list of restaurants to try. Nomad, which is located inside of its namesake, the Nomad Hotel, is located in Chelsea on 28th street. After months of just sitting on my list, I finally found an occasion that would justify spending so much on a piece of chicken – my college graduation. As per suggestions, I made my reservation a month in advance on OpenTable. And even doing so, I was only able to snag a 6pm reservation on a Saturday. I would’ve preferred a 7:00pm or 7:30pm reservation but I’ll take what I can get. We arrived around 5:30 since we came straight from the graduation ceremony and was seated right away. They were also very nice about adding another seat since my good friend also joined us for dinner. After ordering, we were given a mini loaf of freshly baked bread. The bread consisted of chickpeas and rosemary, which were both scattered throughout the loaf. 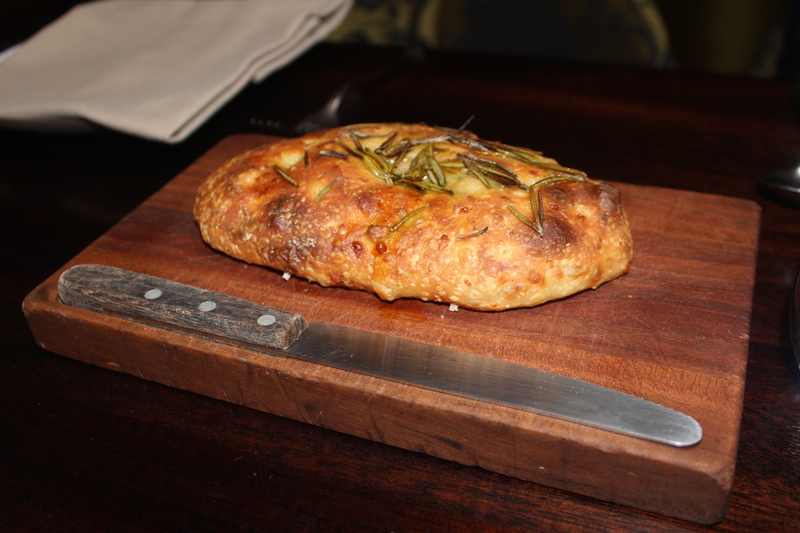 I have to say, this was one of the nicest complimentary breads I have ever been given in a restaurant. We were given one loaf before appetizers and then another loaf while we were waiting on our entrees. I really appreciated this because it gave us hungry people something to nibble on while we waited on our entrees. We opted for appetizers to share since we were all starving from skipping lunch that day. 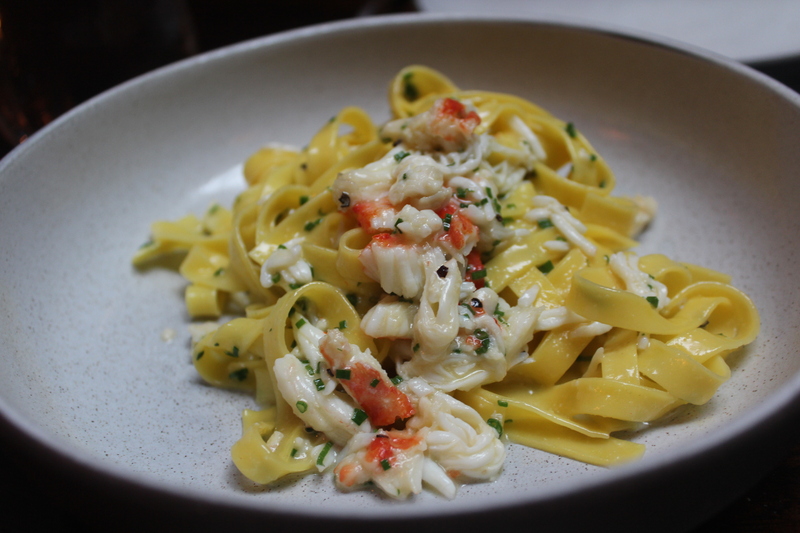 First, we have the King Crab Tagliatelle ($28 for large portion). This is cooked with meyer lemon and black pepper and you can really taste the lemon in it. The king crab was served hot and buttered, which mixed wonderfully with the al dente pasta. It was one of my favorites during the night. I highly recommend ordering this dish to share. 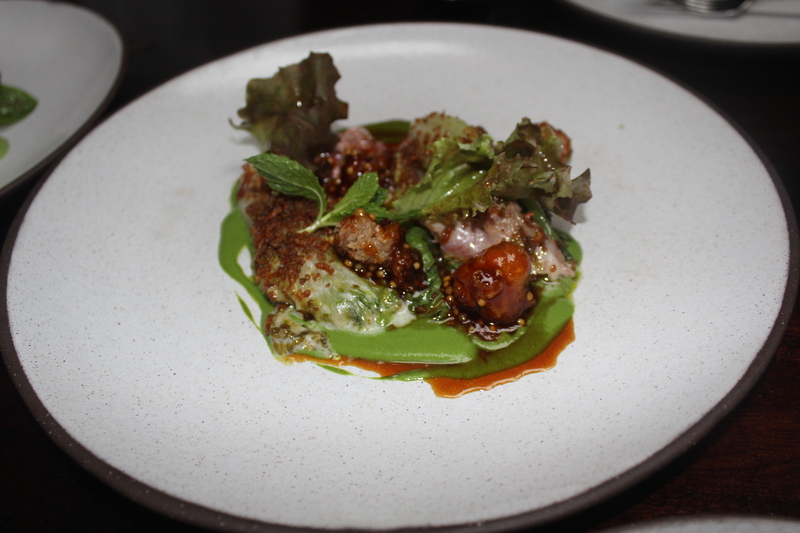 Next up is the Lamb Neck appetizer, which was served with glazed lettuce hearts. There weren’t many pieces of lamb in the dish but from the two pieces that I had, the lamb was very tender and didn’t have that smelly-lamb taste. The glazed lettuce was also quite delicious and flavorful. Our last appetizer was the White Fish Carpaccio. 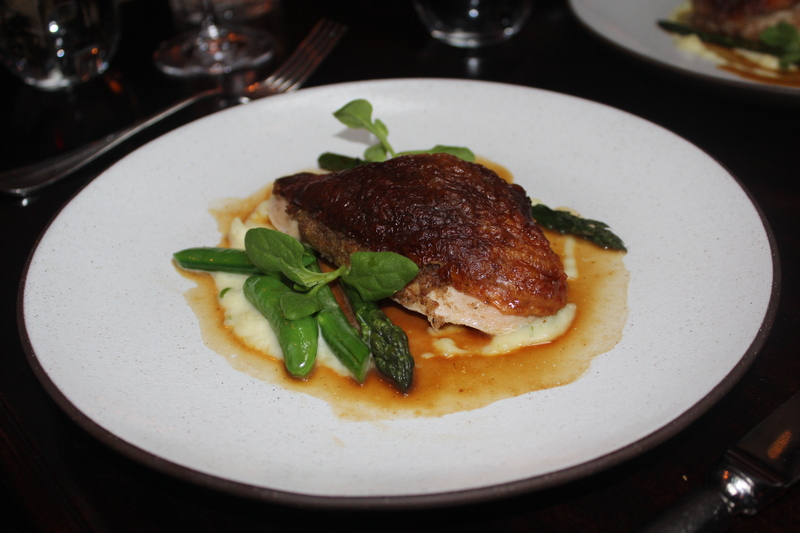 We were a bit taken back by the appearance of the dish but do not let the oddness fool you. The fish was very fresh and had a very crisp taste to it. This was a serious contender for appetizer of the night because it’s simple and clean taste was extremely refreshing. I really recommend this dish as well. But make sure you get your own because it is really that good! As we were munching on our second loaf of bread and chatting, our waitress brought over my Roasted Chicken ($78 for two). I had managed to swindle my mother into sharing the chicken with me. 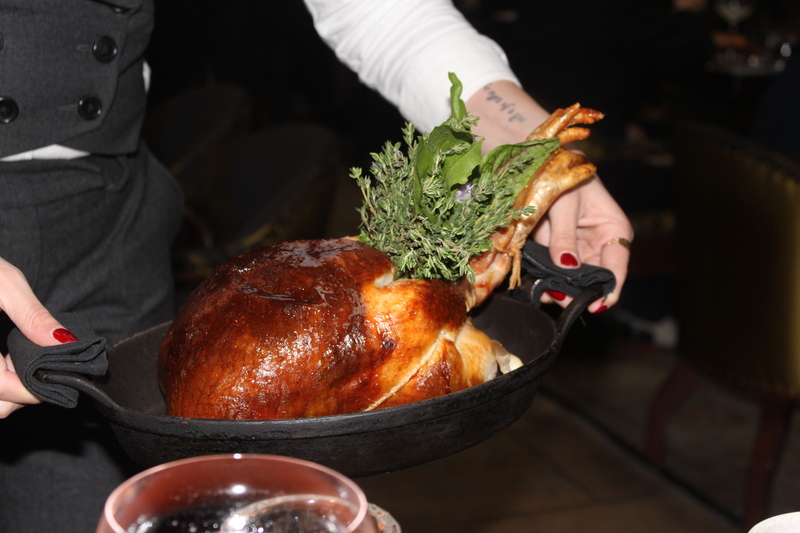 They present the whole chicken to you tableside first. They then take it back for around 15 minutes as they cut up the white meat and cook the dark meat with mushrooms. 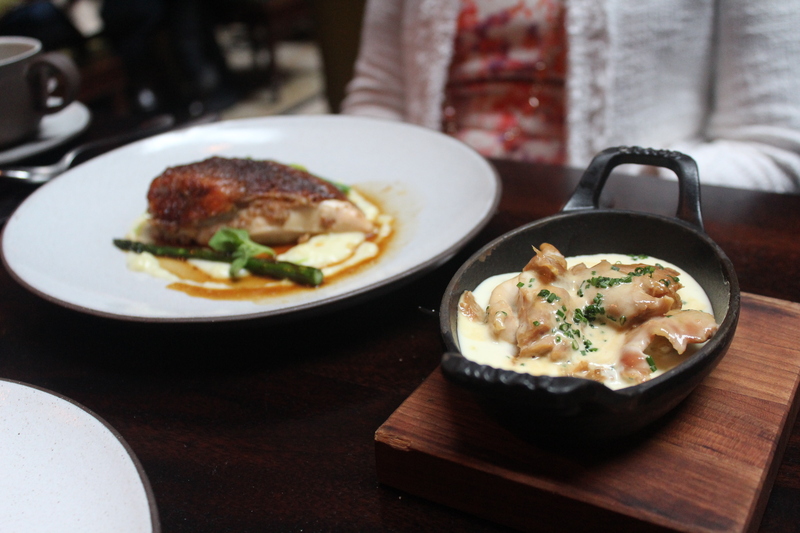 The Roast Chicken breast is sliced into two portions and served on separate plates. It sounds extremely plain and mundane but it’s really not ordinary at all. Underneath the crispy chicken skin is a layer of black truffle, foie gras, and brioche that seals in all the juices of the chicken. The mixture brought a slight saltiness to the chicken. The chicken itself is also very moist and succulent. It is definitely the most perfectly cooked piece of chicken breast that I have ever eaten in my life. The dark meat of the chicken is sliced into slivers and cooked in a ranch-cheese sauce along with mushrooms. The dark meat portion was pretty good but it wasn’t as good as the breast of the chicken. I felt that the ranch-cheese sauce overpowered the taste of the chicken a bit too much. 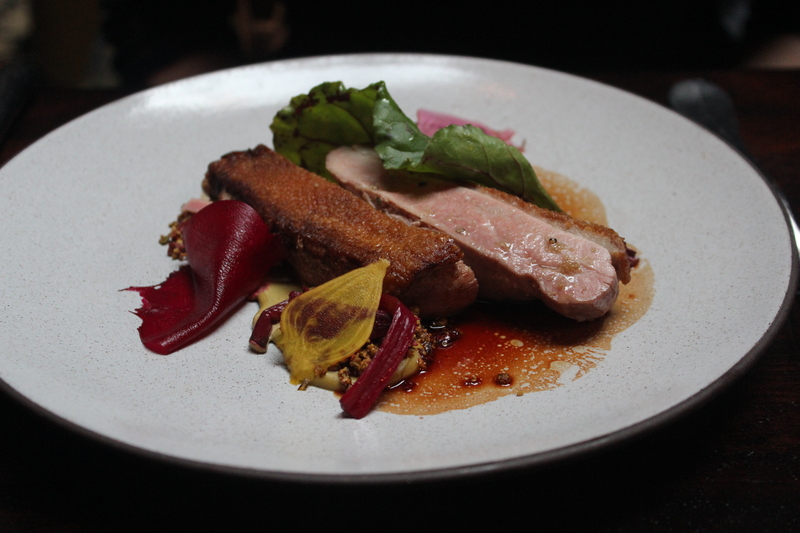 My friend ordered the Duck, which is roasted and served with beets, pistachio and coriander ($34.00). The duck was very tender and flavorful. It’s definitely one of the best duck dishes that I have ever had (with the first obviously being Peking Duck). I’m usually not a fan of beets but I thought it mixed very well with the duck. The portion size was also fairly generous, considering this is a higher-end restaurant. 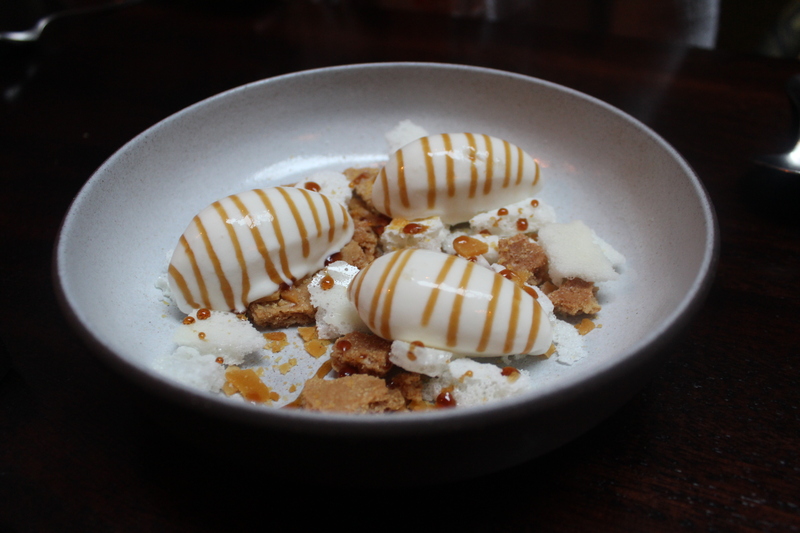 For dessert, we decided to share the highly recommended Milk and Honey ($13.00), which is three scoops of vanilla ice cream served with crumbled oat biscuit shortbread and dehydrated milk flakes and drizzled with honey. I didn’t really care for the dehydrated milk flakes but I enjoyed the combination of shortbread, honey and ice cream. 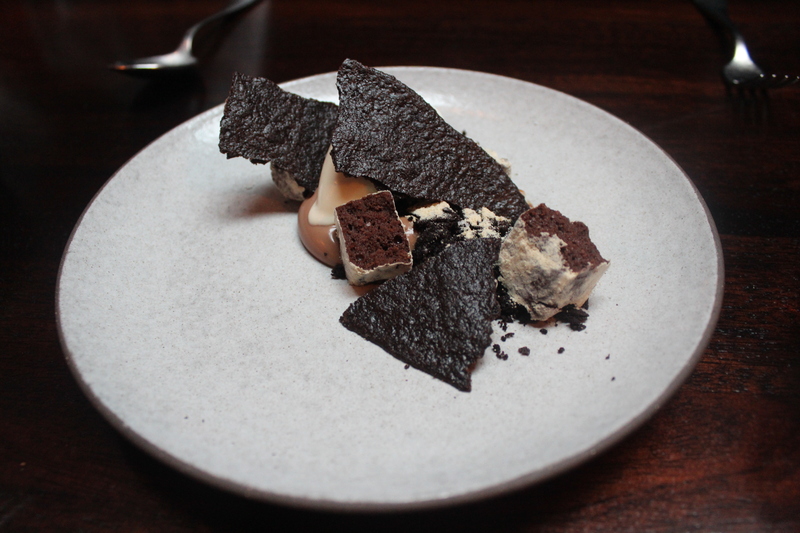 The crunchiness of the shortbread meshed really well with the smoothness of the ice cream. We also shared the Chocolate ($14.00), which is sort of a deconstructed chocolate tart served with caramel, hazelnut and fleur de sel. 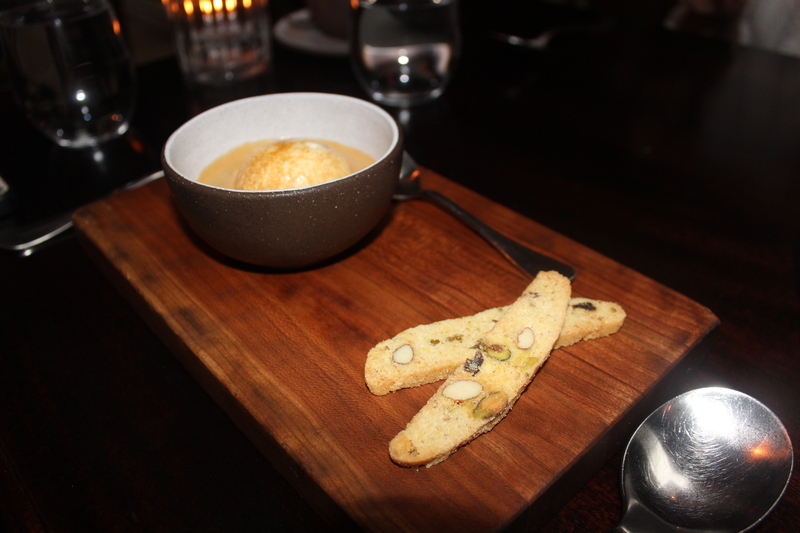 I loved the deconstructed nature of this dessert because it allowed me to combine whichever parts I wanted. The chocolate chunks almost melted in my mouth and meshed really well with the tiny scoop of ice cream in the middle of the dish. I opted for an Affogato ($8.00), which is basically a scoop of vanilla ice cream that is topped with a shot of hot espresso. Our waiter presented the combination to me separately and then helped me pour the espresso into the ice cream. The bowl was really cute and came with two tiny biscotti pieces. I had started getting really sleepy during our meal because I had been up super early for graduation services that day but the espresso kept me up far into the night. Their cocktail and wine list is very extensive – to the point that I didn’t know what to order at all. I asked our waitress for her recommendation and she was spot on. I requested something on the sweet side and she recommended a cocktail with a rhubarb base and a hint of strawberry. It was a pleasant pink color and tasted just the way it tastes. I love it and extremely appreciate it when a waitress or waiter knows their menus – both drink and food. Our service was impeccable and there was not a single complaint that night. 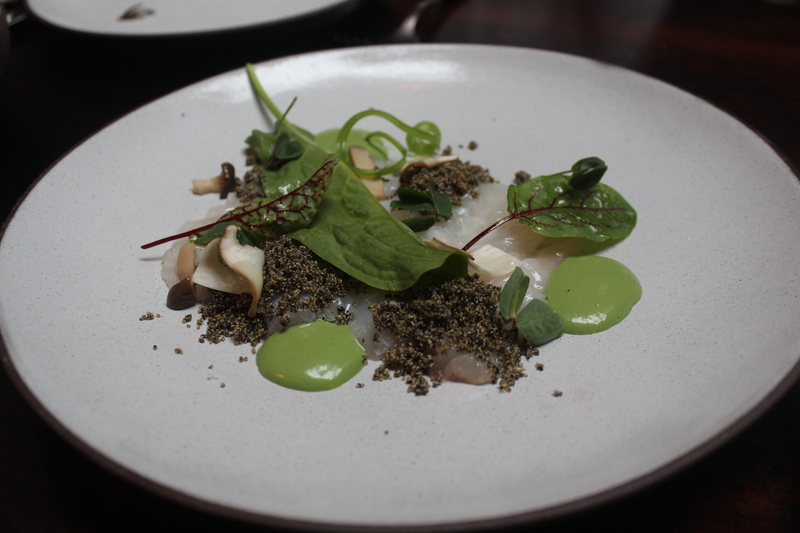 This was one of the best meals I have ever had in my life and I’m glad I decided to spend my graduation celebration at Nomad.